It was the lampshades that frightened me. Pink, gentle tulips by day; at night after lights out, they morphed into vicious monsters with lightbulb tongues. Many children imagine some kind of monster in the darkness while they lie in bed after lights out, and it can take parents several trips and opening and closing of wardrobes to reassure them. So what relief to find a book that helps to assuage fears. 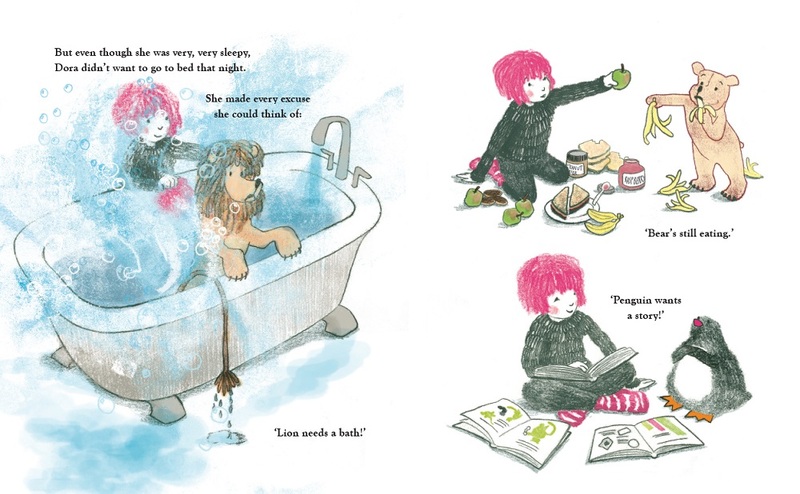 The Wardrobe Monster by Bryony Thomson explores what makes Dora and her toy friends afraid to go to sleep, and grouchy the next morning. It actually is a monster in the wardrobe, but this monster is as scared as they, and so they all snuggle in bed together, until another bump gives them a fright. Thomson’s book is delightful in its premise, but most particularly in its illustrations and depiction of Dora and her soft toys. They are as lifelike as Woody and Buzz, and inflected with as much personality as Pooh, Eeyore and friends. The Wardrobe Monster is Bryony Thomson’s debut picturebook, and from this superb start, it’s easy to see that she’ll go far. The Wardrobe Monster is a comfort book for those children who have a fear of the dark. How did you counteract this fear when you were young without The Wardrobe Monster to help you? I’m not sure I had a very good system – that’s partly why I wanted to write The Wardrobe Monster. I had a very vivid imagination as a child and can remember lying in my bed at school as various pipes and bits of furniture in the enormous dormitory creaked and groaned, making up all sorts of possible scenarios for what could be causing the noise. That would usually go on until I couldn’t keep my eyes open any more! The soft toy teddies in your book all have distinctive characters, something the publisher compares to those in Winnie the Pooh. Was that an influence on you? And which other books/illustrations have influenced you? I would definitely count Winnie the Pooh as one of the long term influences on my work. It was one of my favourite books growing up, in particular the incident where Pooh goes to visit Rabbit, eats too much honey and condensed milk and gets stuck in the rabbit hole. The characters all have such distinctive voices, I can still hear them in my head (the way my Dad used to read them) and that has had a massive influence on my storytelling. In terms of other books and illustrations, I would say Rebecca Cobb’s books such as Lunchtime and Aunt Amelia. I love the simplicity of her stories and illustrations, there is a real sense of joy and magic to them. Laura Carlin has also been a big influence from an illustration point of view. When I began to study how her drawings are connected to reality and observation whilst at the same time incorporating a high level of stylisation it was a real revelation and opened a lot of doors. Somehow it gave me the confidence to let go of the need to make everything completely accurate and true to life. The pictures in the book feel so warm and enticing to children because they look as if they were done in crayon. What medium did you do the book in, and which medium do you prefer? The book is made with a combination of monoprint and pencil scanned in, layered together and then coloured in Photoshop. This process was something new I discovered while working on the early stages of this book and I feel it suits the story well. I don’t know whether I have a favourite medium as I’m always trying to discover the best thing for a particular story. I do have a never ending love affair with screenprint but I find it rather too labour intensive for books; it is too much of a disaster when you get something wrong! For me the choice of medium is always about creating a high enough level of uncertainty in the end result. I’m naturally a real perfectionist and so to fight against this I try to use media that I can’t fully control; often it is the mistakes or unexpected outcomes that lead to the biggest breakthrough in the artwork. I think that is why I like print techniques as you never really know how something is going to turn out until you’ve done it. I adore the main character’s distinctive hair colour and matching slippers. Was this something that occured to you near the beginning of the process, or an inspired decision near the end? Dora’s hair was pink right from the very first draft of the story – possibly because I’ve always wanted to have pink hair! What came later was the idea to incorporate some of the pink into the Wardrobe Monster to create a connection between the two characters. As if, even though this was an enormous scary monster, there was something in him that Dora could immediately recognise and empathise with. You’ve avoided using gendered pronouns for the soft toys in your book. Was this a reaction to the recent survey regarding male gendered animals in picture books? Whilst I thought that survey was incredibly interesting in terms of reflecting how we naturally tell stories, it wasn’t actually an influence on my decision; I made the choice right from the very beginning, a long time before the survey results came out. My reasoning was that I knew I wanted a female lead character in Dora – in large part because she represented me in the story – but I was very aware that I didn’t want to create a book that appealed solely to girls by designating the other characters as male or female. I have a very clear idea in my head of the genders of the other characters because of who I have based them on in real life, but I wanted the reader to be able to see them in their own way. You mention that you went to boarding school. Not many children are used to that concept now. Was it all midnight feasts and tuck shops? Not really…there certainly was a tuck shop and the occasional midnight feast but mainly it was just lessons, really horrible school food and slightly old fashioned plumbing (my first school was in a very old stately home in Norfolk)! I went when I was 8 through until I left school at 17 and found it quite hard. You get used to the routine of being away from home but it doesn’t really make you miss it any less. What it does give you, however, is a fantastic education, as there are far fewer distractions and a lot of confidence in your own ability to cope with whatever life throws at you. Plus for me it gave me the inspiration for The Wardrobe Monster! Do you have a favourite soft toy that you took/take to bed? When I was born my grandmother made me a soft toy dog with long ears and a zip in her tummy for my pyjamas; I called her Debbie. She is now unbelievably battered and threadbare and is living out her well earned retirement at my Mum and Dad’s house. Where do you do your illustrating? Do you have a particular desk/pen? I have a little basement studio at our house in Surrey which I absolutely love! It is really quiet and peaceful and I can shut the door and get totally immersed in whatever I’m working on. I don’t have a particular pen but I do have very specific tools for different jobs – for rough drawings and character development I need a Castell 9000 2B pencil and for monoprinting a Caran d’Ache Neocolor II crayon and Grafwood 3B pencil. I’d love to say that I’m really flexible and can pick up anything to draw with but if I don’t have those three things there is usually a bit of a crisis, followed by some speedy internet shopping! Most treasured childhood memory: Every year for my birthday we used to go to one of the local farms to see the new lambs, you could stroke them and pick them up, it was magical. Best place in the world: Suffolk without a shadow of a doubt – that’s where I grew up. Favourite childhood book: Hard to choose just one but Ballet Shoes by Noel Streatfield, I must have read it or been read it dozens of times. With thanks to Bryony Thomson for answering my questions. You can find her website here, and seek her on twitter here. 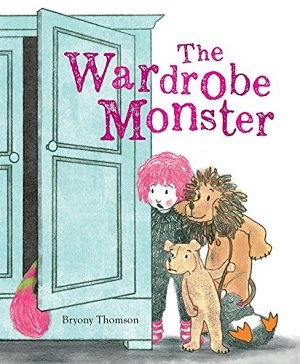 If you want to read more about Bryony Thomson, have a look here tomorrow for more on Bryony’s blogtour, and you can buy your own copy of The Wardrobe Monster here.